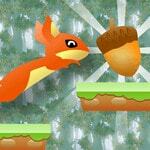 Operate белочкой in game Nut Rush and collect on a way tasty acorns. Jump over precipices and reach a small house whole and safe. To carry out this problem and to pass one acorn, to be necessary to work hard.